Ripe fresh fruit is the ubiquitous answer for serving a quick dessert, but a bowl of it often falls short of being considered real dessert, the dish that provides the final touch to a meal. Here is a recipe that is easy to make, features ripe fruit and presents it in a combination of flavors that were made for one another. A classic Piemontese dessert, baked peaches is paired with amaretti and hazelnuts, typical ingredients of the region's cuisine. Often cooks mix the filling with egg and peach puree; but that becomes mushy. I prefer to mix in only one egg and I add just a hint of cocoa. The cocoa brings depth of flavor and aids in stiffening the filling so it puffs up retaining a slightly crunchy texture to the warm luscious fruit. 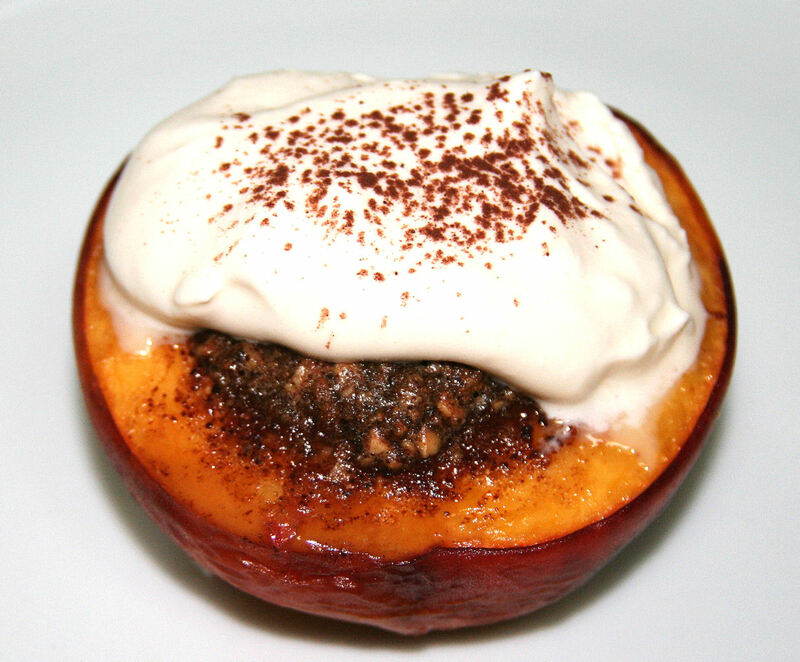 Accented with a pillow of softly whipped cream and a sprinkle of cocoa on top, this remarkable fruit dessert will bring that final note of complete satisfaction to your meal. 4 to 8 servings. Baking time is 20 to 25 minutes. 1. Preheat the oven to 350º F/175º C/Gas Mark 4. Mix together the amaretti, hazelnuts, cocoa and beaten egg, stir very well until thick. Brush a very small amount of olive oil on the skin of the peaches or nectarines, then arrange in a baking pan. Put about 2 teaspoons (10 ml) of filling in the center of each peach or nectarine half, where the hollow where the stone or pit used to be. 2. Baking: Place in the center of the preheated oven and bake for 20 to 25 minutes or until the filling puffs up a bit and turns dark brown. Remove the pan from the oven and let the peaches or nectarines cool for several minutes until they are barely warm to the touch. 3. Serving: The skin of the fruit softens during baking and is delicious; however if you prefer, gently hold the baked fruit and remove its skin, it slips off easily. Whip the cream to soft peak then garnish each baked fruit with dollops of it. Sprinkle with cocoa and it is ready. This dessert is so light, be sure to offer seconds.